The dimerization cofactor of hepatocyte nuclear factor 1, or DCoH, is a bifunctional protein that functions as both a transcriptional coactivator and a metabolic enzyme. Here we are looking at DCoH purified from rat liver. It is suspected to be involved in stimulating the expression of homeodomain-containing, hepatocyte nuclear factor 1 controlled genes. HNF-1 genes are involved in growth and development of the liver. It is possible that it does this by enhancing dimerization and stability of HNF-1 proteins. DCoH may also bind products of target genes or different components of the transcription complex. The mechanism of transcriptional coactivation by DCoH is much less understood than its metabolic enzyme function. DCoH was originally only known for its enzymatic function as it was shown to catalyze the dehydration of a 4a-carbinolamine form of the biopterin cofactor utilized by the aromatic amino acid hydroxylases and NO synthase. Its Pterin 4a-carbinolamine dehydratase (PCD) activity of DCoH with the enzyme dihydropteridine reductase regenerates the active reduced form of the cofactor. PCD dehydrates spontaneously in aqueous solution, but at rates too slow to support the maximum turnover rate of phenylalanine hydroxylase. 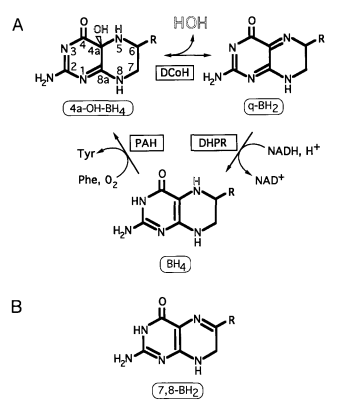 In the cell, DCoH-catalysed dehydration reaction appears to prevent the formation of 7-substituted pterins which are caused by spontaneous rearrangements of pterin-4a-carbinolamine. Often large amounts of 7-substituted pterins are excreted in patients with mutated DCoH genes, so the function of DCoH in blocking the pterin cofactor from rearranging is potentially just as important as its function stimulating aromatic amino acid hydroxylase enzymes. .
DCoH is a containing four identical monomers A, B, C, and D. Each monomer consists of an antiparallel surrounded by three These monomers interact with one another along two different interfaces. The is made of antiparallel H2 helices and S3 strands from neighboring monomers. The interactions between the two subunits creates a a continuous eight-stranded antiparallel Beta-sheet. This saddle houses a that contains an aromatic arch, including residues Phe 43, Phe 47, His 63, Trp 66, and His 80. The other type of interface, the consists of interactions between the of all four monomers. DCoH crystals have two independent tetramers that differ structurally from one another due to crystal packing forces. Monomer conformational differences occur mostly in the chain termini and of the saddle. The stirrup is composed of loops made from residues 28-32 that connect beta-strands 1 and 2. The cause the saddles to vary in width from 24 A to 27 A.. Along with the varying widths of the saddles, The of Arg 21, Phe 35, Gln 37, His 39, His 74, and His 80 all adopt different rotamers in the eight different monomers. Four of the side chains can even be found in the saddle which suggests that the saddle actually has an element of plasticity. One major difference between the crystal contacts of the two different tetramers is that one tetramer packs an into the saddle of a neighboring molecule. 7,8-dihydrobiopterin (7,8-BH2) is a ligand that binds four clefts(the proposed active sites) of DCoH. Residues that are found in both monomers of the saddle-forming dimer can be found in the clefts. These clefts border the The active site is lined by the His 62, His 63, and Pro 64. Asp 61 and loops containing Leu 78-Gly 81 and Val 69' -Tyr 70' of the adjacent monomer are also found in the cleft. In order to form the active site, Asp 61, Ala 83, and Tyr 70’ must be in a left-handed helical conformation. Within the arch of aromatic residues that form the hydrophobic core, the 7,8-BH2 molecule binds the active site. Cronk, J., Endrizzi, J., and Alber, T. 1996. High-resolution structures of the bifunctional enzyme and its transcriptional coactivator DCoH and its complex with a product analogue.Protein Science. 5:1963-1972. Endrizzi, J., Cronk, J., Wang, W., Crabtree, G., and Alber, T. 1995. Crystal Structure of DCoH, a Bifunctional, Protein-Binding Transcriptional Coactivator. Science268: 556-559. Frank J. Gonzalez. 2008. Regulation of Hepatocyte Nuclear Factor 4 alpha-mediated Transcription. Drug Metab. Pharmacokinet (2008). 23: 2–7.